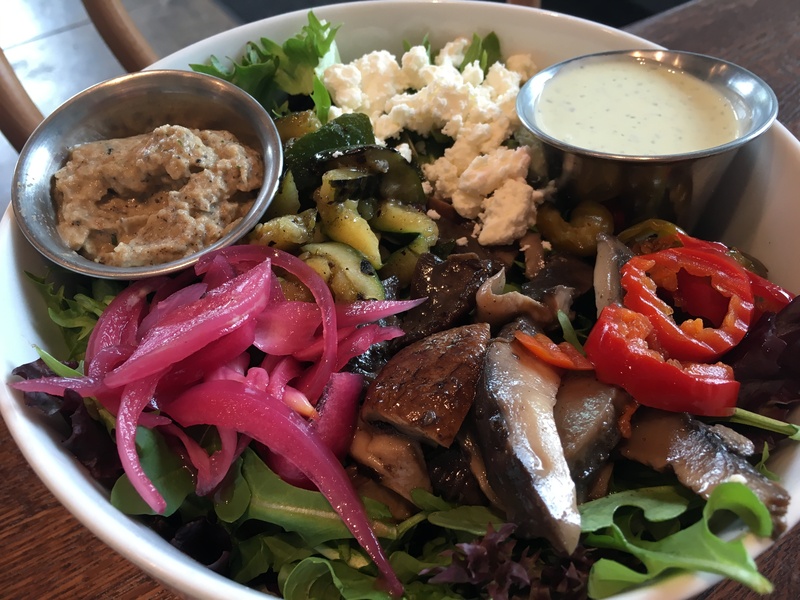 If you spend any time at all in Lakewood, you’ve surely seen the gorgeous corner on La Vista and Abrams that has housed Unleavened Fresh Kitchen for the last six months. As the name implies, Unleavened is a fast-casual restaurant where healthy and fresh dining options become accessible for all. It isn’t too often that I say that a restaurant truly has something for everyone but I genuinely feel that way about Unleavened Fresh Kitchen. Craving Fried Chicken? No problem. Vegetarian? That’s cool. In need of a power breakfast? Perfect. You can find it all here at Unleavened! Their menu is simple and to the point. All of their salads can be done as a wrap and vice versa. They have delicious dips and various sides that will satisfy any craving and their portions are VERY worth it. 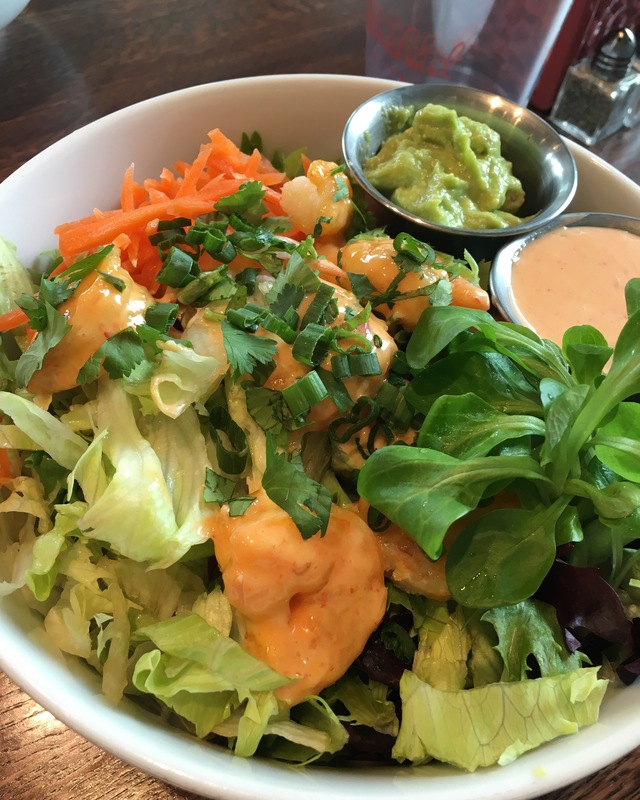 The West Coast Salad: Corn Starch Fried Shrimp with Mâche, Iceberg Lettuce, Green Onion, Cilantro, Shaved Carrot, Spicy Avocado and Sweet Thai Chili Aioli. This may have been my personal favorite dish of the entire afternoon. The shrimp is absolutely incredible and I would pop those suckers like popcorn if I could. The spicy avocado allowed for just the right amount of kick and helped balance out the clean flavors of the other vegetables. Not going to lie – I will probably order this every time I pay a visit to Unleavened. 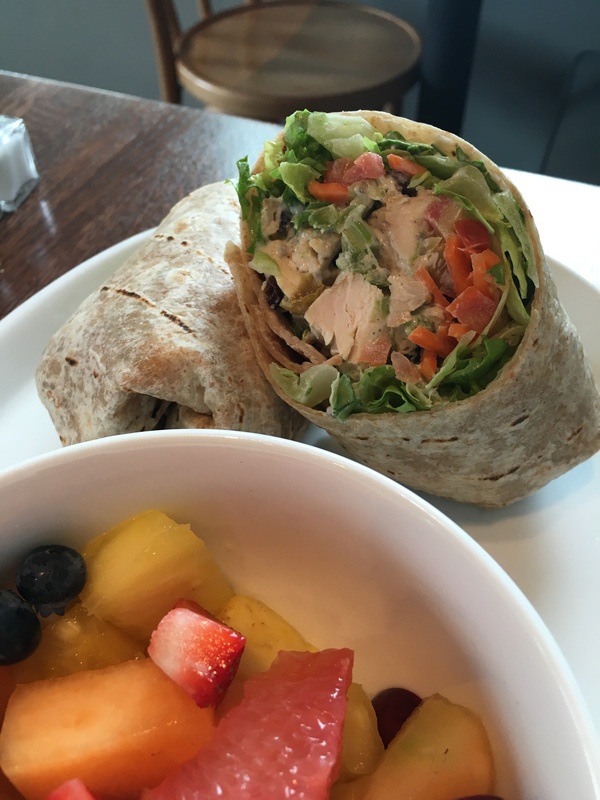 The Unleavened Wrap: Chicken Salad with Currants, Golden Raisins, Celery and Chia accompanied by Leaf Lettuce, Shaved Carrot, Garden Sprouts and Tomato. This is proof that the perfect Chicken Salad does exist. Clean and light but somehow hearty and filling, I feel like I have been doing it wrong my whole life before I met this gem. Don’t let the picture fool you, this wrap is huge! I took my second half home and had it for lunch day and believe it or not, it was just as good if not better the second time around! Spicy Avocado, Smokey Garlic Crema and Cucumber Dill Dips. 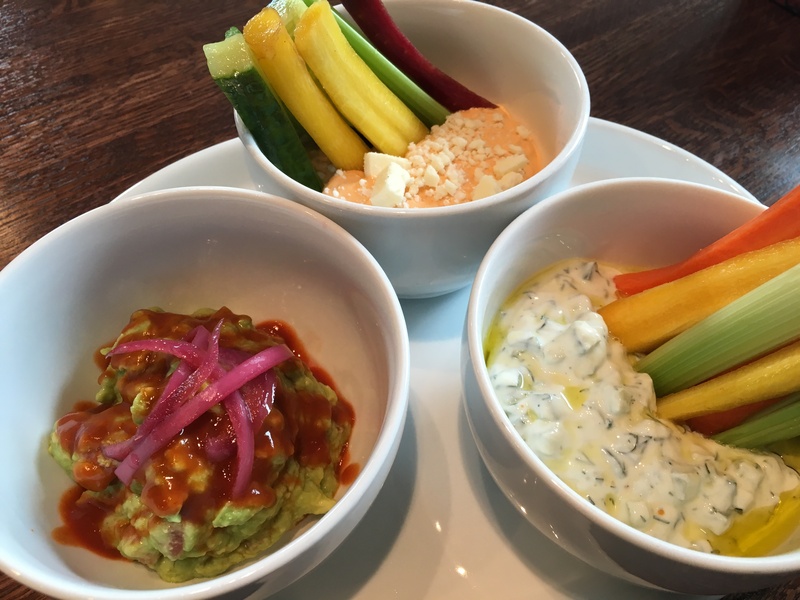 All of the dips here at Unleavened are served with your choice of Grilled Flatbread, House Chips, or stunningly beautiful Raw Veggies. Again, the portion sizes on the dips are more than generous with prices ranging from $3.50-$4.50. These aren’t tiny little side bowls either, they are soup bowl size so YEAH – the only obvious choice is to not choose and get them all. Where are my veg-heads at? The Farmstand Salad could turn even the most dedicated carnivore into a vegetable lover. Portobello Mushrooms, Arugula, Mâche, Cherry Peppers, Grilled Zucchini, Pickled Onion, Feta, Roasted Eggplant with Green GoddessDressing make up this anything but ordinary nutrient-packed salad. All too often restaurants skimp on vegetarian options because they lack creativity or maybe they just don’t care. After all, a salad is just a salad, right? Well, not here at Unleavened Fresh Kitchen and the Farmstand Salad is proof of that. It’s safe to say that I have found my new obsession and when you practically eat for a living, being obsessed with a healthy, fresh and most importantly (for me) delicious concept is one for the record books. Nothing about Unleavened left me wanting more. It is truly perfection in each bite and I hope you will go see for yourself how incredible eating great can be. Oh, and parents – kids eat free after 4pm EVERY SINGLE DAY. Also, there is wine on tap. Yep. You’re welcome.